Okay, okay—camping isn’t really about fashion. We love a no-makeup, no-stilettos weekend in nature too. But just because you’re roasting marshmallows and pitching tents doesn’t mean you can’t look just a little fabulous, right? Whether you’re staying in a yurt or backpacking to a lake, here are three ways to dress great while camping. Glamping is the answer to the glam girl’s need for R&R, without sacrificing the finer things. You won’t be getting dirty so enjoy your decked-out airstream and wine & cheese plate in versatile white jeans. Pair ‘em with a cargo jacket at night—and throw in some tie-dye for good measure. Stylist Tip: Dry shampoo, lip stain and eau de toilette are glamping beauty essentials. 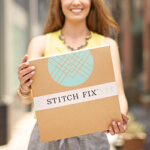 Keep them stylishly by your side by packing them in your favorite colorful tote! Ready to hit the road? Pack your car to the gills and camp in style with a cargo vest and an eyelet tank. Slip-on flats will be easy a godsend when you’re getting in and out of your tent, and a fashion-forward baseball cap will help shade you from sun rays during the day. Grab your backpack—it’s time to spend the night under the stars. Your go-to’s for this trek? Comfortable and lightweight style staples. 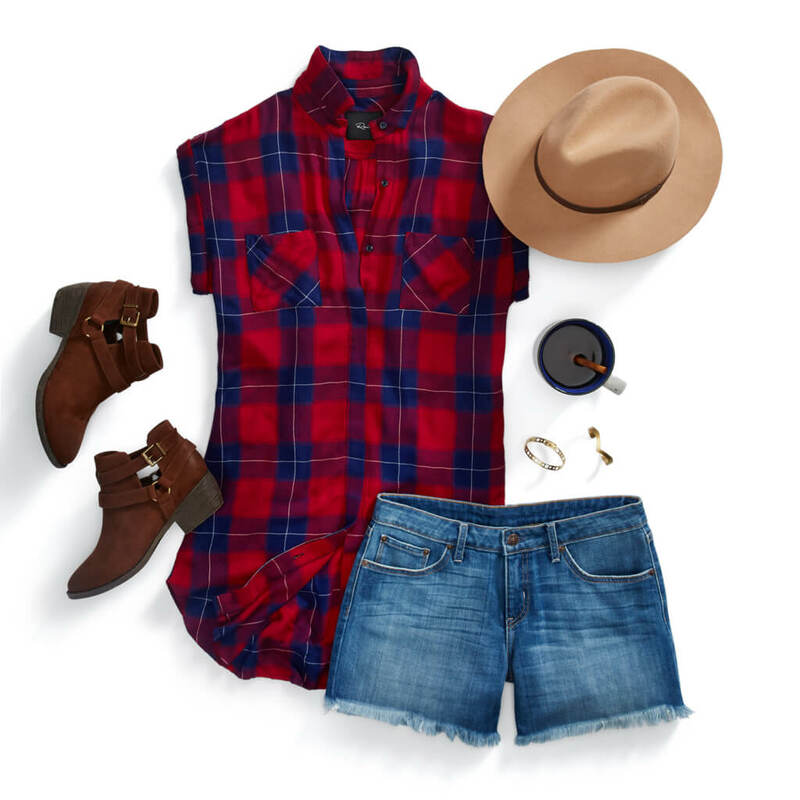 A rugged camping trip wouldn’t be the same without a plaid shirt and a pair of jean shorts— bring your favorites along! Ankle boots will withstand the dustiest of trails. Stylist Tip: Isn’t that first shower when you’re back in civilization grand? Tide yourself over by hiding your dirty lock under a stylish straw fedora. Going camping this summer? 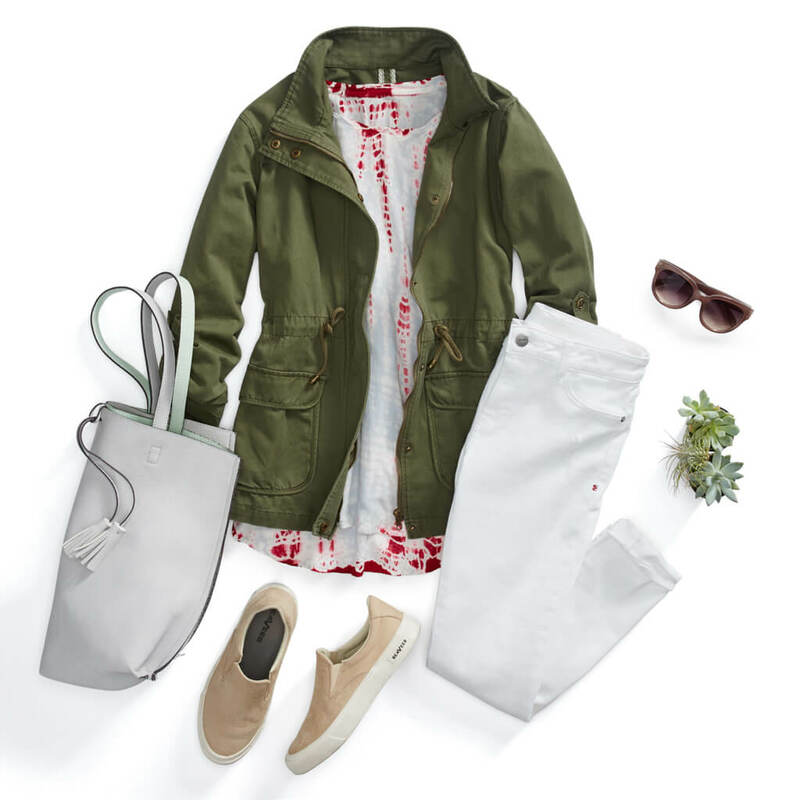 Let your Stylist hook you up with some outdoorsy outfits.